Just one question to answer today – HEY, IT'S PAT RYAN'S BLOG! Please, no pushing, you will all get a turn. This dropped out of the electronic wind earlier this week; I can’t make out what conclusion this rigorous experiment returned, but I thought you’d like a chance to answer the lad’s question—click the comments balloon at the top right. Previous Post We can’t all start thinking for ourselves, of course…but Wowie! Prahaps it’s a trick question. There will be no heaven, just a continuous reallocation of atoms. If so, then what becomes of our fine young man? I find it unsatisfying to imagine that the bits of him would be continually redistributed and never settle down together long enough to learn the answer which he seeks. Or to share fashion tips. 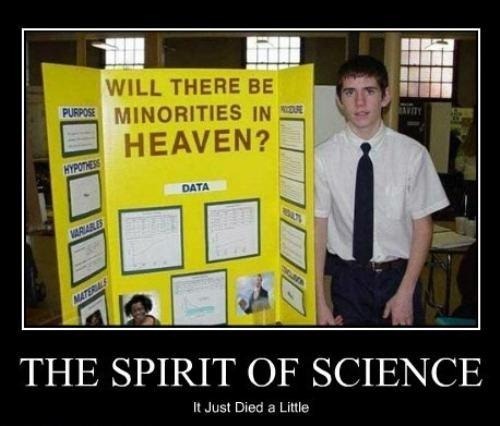 hehe – I think I find his question slightly unsatisfying – there are too many implicit assumptions…it starts “Will there be” – I’m guessing he means “when I get there” (or does he mean “will there ever be”) – the question asks nothing of the state of heaven right now nor of what counts as a minority. Pete, I’m thinking that signing up little Thomas Aquinas here for your Logic and Reasoning class (meeting right after his science lab) might be a good first step toward straightening out his thinking. hehe – Pete’s 12 Step program for the rationally challenged? Still, I should probably go easy on him. I figure that everyone is completely illogical and unreasonable most of the time – of course I’m generalizing from a sample of one, but then everybody generalizes from a sample of one (at least, I do).